Question title: cannot be deactivated. You can edit that title on the quiz slides, do not delete it. Question: same, change the style if wanted but never delete. Answer area: compulsory as well. If you expect long and/or many answers, I recommend to make this area as big as possible on the master slide. If you want custom objects on the quiz slide (like an image), free some space by editing the size of this area. 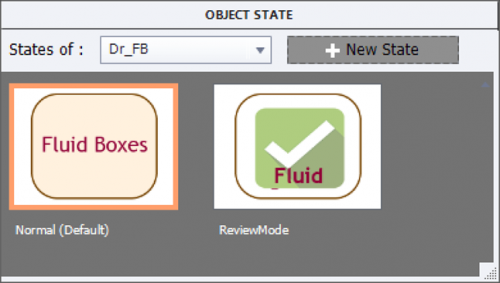 For a Fluid boxes quiz slide, you’ll need to add a fluid box for that purpose. More information in Fluidize your quizzes. Answers: it is not possible to resize the individual answer size on the master slide, only on the quiz slides. Of course you need this object. Feedback messages: are stacked in the same location (also in fluid boxes, by using a static fluid box). In the screenshot the Review area is also stacked in the same location. It has almost no meaning anymore since it is only used for skipped questions. Quiz Preferences offers no way to activate/deactivate the messages, that has to be done with Quiz Properties for the quiz slides. Failure message: normally set to 1, with the dropdown list you can choose ‘None’. If you have more than 1 attempt on quiz level, you can add up to failure messages with that same list. Retry message: becomes available when the number of attempts is greater than However if you have more than 1 Failure message it will be dimmed. Partially correct message will appear instead of the Correct message when Partial scores is turned on and the question is not answered fully correct. 7. Clear button: can be turned on/off both globally (see the screenshot above from Quiz Preferences, Settings). In the default setting it is turned off. It is possible also to turn on/off on individual quiz slides using th Quiz Properties (see screenshot top right). 8. Back button: is a bit confusing. You can turn off ‘Allow Backward movement’ in the Quiz Preferences, which will automatically result in having the Back button disappear on quiz slides. However, when using remediation, where you want to send the learner back to a content slide, you have to turn this option on. 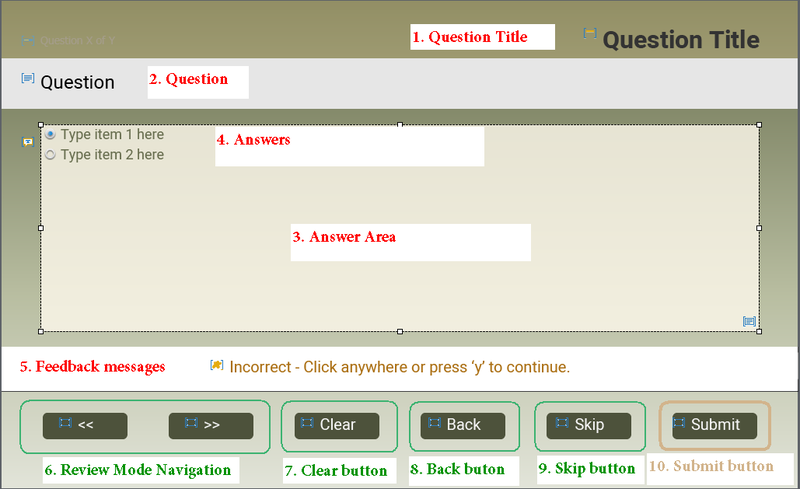 Having a Back button on a questions slide is not a good idea, since answers are frozen once the question slide is left. Learners cannot re-enter an answer. One exception: when Submit All is turned on (see future article). Even when ‘Allow Backward movement’ is turned on, you can still check off theBack button on all quiz slides with Quiz Preferences, Settings. You can also do it individually using the Quiz Properties for the question slide. 9. Skip button; is turned off by default, can be turned on both globally and for individual quiz slides. 10. SUBMIT button: is the most important object on this slide. There is no way to turn it off, not globally nor individually. It is that button which is responsible fir the two-step Submit process. Remember: quiz slides have a pausing point by default which cannot be turned off (you can move it only with the mouse). There is no answer or answer is not complete: Incomplete message appears. The answers were totally or partially correct. The feedback message Correct (or Partially correct) appears. The answers were not correct (partially correct is considered as correct). If there are multiple attempts, not exhausted, and multiple failure message: the appropriate failure message appears. Make sure to indicate that they can retry except for the last failure message. All messages, except the Retry message and the intermediate failure messages (not the last one) should indicate how to trigger the second step. For all types of quiz slides, except the overlay quiz slides in a VR project, that will be ‘click the slide or press Y’. The goal of this first step is to offer the learner as much time as necessary to read the feedback messages. Some developers don’t like the present workflow, will post some possible tweaks in a future post. Personally I hope that the new workflow for the overlay quiz slides in VR projects, which is more user friendly, will be extended to the other types of quiz slides. With this step the playhead will be released, same way as what happens with an action when the option ‘Continue Playing the Project’ is activated. It can only happen in two cases: for a correct answer, or for a Last attempt answer. 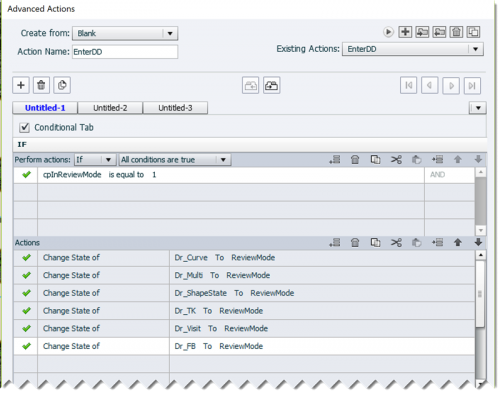 Correct answer: the action ‘On Success’ specified in the Quiz Properties panel will be done. Beware: default action is set to ‘Continue’. It means that the released playhead has to travel through the inactive part of the slide (the part after the pausing point). It it is only the default 1.5secs, that may be OK. However if you added slide audio, and forgot to move the pausing point closer to the end of the slide, that may be a long waiting time for the learner. Alternative could be to replace the action ‘Continue’ by ‘Go to Next slide’. In most cases that works fine, some users could have issues in case of low bandwidth and slow reactions of the LMS due to hardware problems. I had that problem in college when too many students were taking the same assessment, due to outdated switches. Wrong, last attempt: the action ‘Last Attempt’ will be done. Same comments as for the Correct answer concerning the pausing point and audio. Look at the screenshot below: due to the audio clip, if you leave the action to the default command ‘Continue’, the learner will have to wait 4 seconds before getting to the next slide. Better drag the pausing point to almost the end, at 4 seconds. You cannot use the Timing properties panel to do so. The post Captivate’s Quizzes (2): Submit Process appeared first on eLearning. Situation was here a quiz preceded by content slides. The learner had two attempts on quiz level. After a first failure he should view the content slides again. I will explain how to change the proposed solution if you have more than 2 attempts and want the watching of the content only to happen after a second (or later) failure. cpQuizInfoAttempts: that variable will be incremented when the Retake button is pressed. After the first Quiz attempt, on entering the score slide it will have the value 1.
cpQuizInfoPassFail: is a Boolean, with value = 0 if the learner has failed, and value = 1 if he has passed. The condition requires that it is the first attempt and that the learner failed at that attempt. If that is the case, the navigation is to the first content slide (content slides are before the quiz). If it is the second attempt, Continue will have the score slide appear with the results. After the first attempt that score slide will not be shown. In this situation the score slide will appear after the first failure, and the user will have to press the Retake button for the second attempt. If you are not in a Fluid Boxes project I would recommend to drag the Review button under the Retake button in that case. 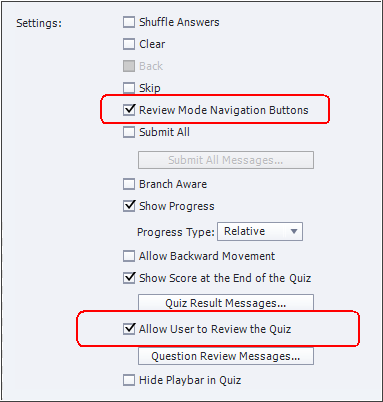 That will prevent that the learner clicks the Review button, which would cancel all future attempts on quiz level. For a Fluid Boxes responsive project however this is impossible because you cannot have two objects stacked in the same location. BTW: you can also use this workflow for question slides inserted on hotspots in a 360° image or video, and in an interactive project which has question slides. The post Retake Course before Retake Quiz after first Failure appeared first on eLearning. If possible to access on anytime that two buttons (Retake quiz and review quiz) in result slide. I have inserted two buttons (Retake quiz and review quiz) in results slide. First, I’m clicking the review button going to showing them which is a correct and wrong answer, then come back result slide retake button hiding. If possible to access on anytime that two buttons (Retake quiz and review quiz). The post If possible to access on anytime that two buttons (Retake quiz and review quiz) in result slide. appeared first on eLearning. Tes movie has only one Drag&Drop slide in the Quiz. Quiz is set up with 2 attempts on quiz level, Retake button will appear after the first attempt in case of failure. After passing the quiz or after the last attempt the Review button will appear. To avoid the usual confusion between Retake and Review, I dragged the Retake button under the Review button. The D&D slide is set up as scored slide by turning on Reporting. If you don’t do that, it would be considered as a Knowledge Check slide, and reset immediately after leaving the slide. Clcik on this arrow to start viewing the movie. The trapezoid shape which is used as drop target, will accept all drag sources. They will be tiled when dropped on the target, both size and opacity are reduced a bit. All drop targets (and drag sources) can have several InBuilt states as I explained in this post: States for D&D Objects. Typical for InBuilt states is that they only occur in specific situations, as a developer you do not have the control like for custom states. In the mvoie you will have seen, based on your answer, one of these two states appear during Review. The labeling of states allows to reuse the same state name for multiple items I sued ‘ReviewMode’ as state name for all the drag sources ‘(6). I used the possibility to fill a shape with an image, and it still accept text. Although Retake seems to clear the previous dragging actions, after taking two attempts, during Review you’ll see that all the drag sources which have been moved during the two attempts appear in the Drop target. I couldn’t figure ot how to avoid that, nor if this is by design or a ‘bug’. If I ever find an answer, will edit this blog post for sure. Due to the way te score slide is designed (Continue button has to be clicked) it is good practice to add at least one slide after the Score slide. You’ll reach it when clcking the Continue button. The post Drag&Drop in Review mode? appeared first on eLearning.